Milkshakes for breakfast. Not quite what you might expect from food to glow. Kale shakes, like my kale berry smoothie perhaps. But not a milkshake. And most certainly not one for breakfast. I have previously had a rant about terrible breakfasts, but not a word did I write about milkshakes. Who in their right mind would have a milkshake for breakfast? All that sugar and saturated fat? Surely this is something only children might crave. Well… despite my predilection for savoury, kale-infested packed breakfasts (my recipe index tells all…), the idea of a milkshake – a healthy one – on a hot summer’s day actually sounds kinda nice. So, if I think it sounds nice, 99% of the population probably thinks so too. And, this bad boy is adults only. Unless you like your children wired and tearing around the house like Superman. This healthy frozen froth gets its wakeup call from coffee, frozen bananas, and a surprise ingredient…oats. You read me right. Oats. Toasted or straight from the packet – doesn’t matter. I know it sounds completely bonkers but trust me, it works. Being an adopted Scots, oats are a big part of breakfast equations: as porridge, in granola, as rough and ready muesli, in muffins, breakfast-ish bars, pancakes. 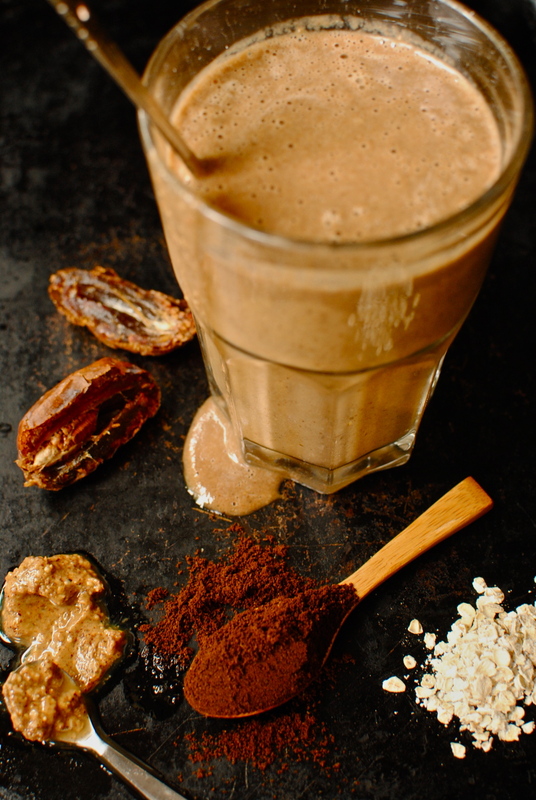 And now it joins forces with frozen bananas (which also make a dreamy one-step ice cream), cold coffee and a smidge of almond butter to make an incredible breakfast shake. No added sugar, but plenty of energy-boosting protein. If you want to smooth out the screechy caffeine edges, go decaf. 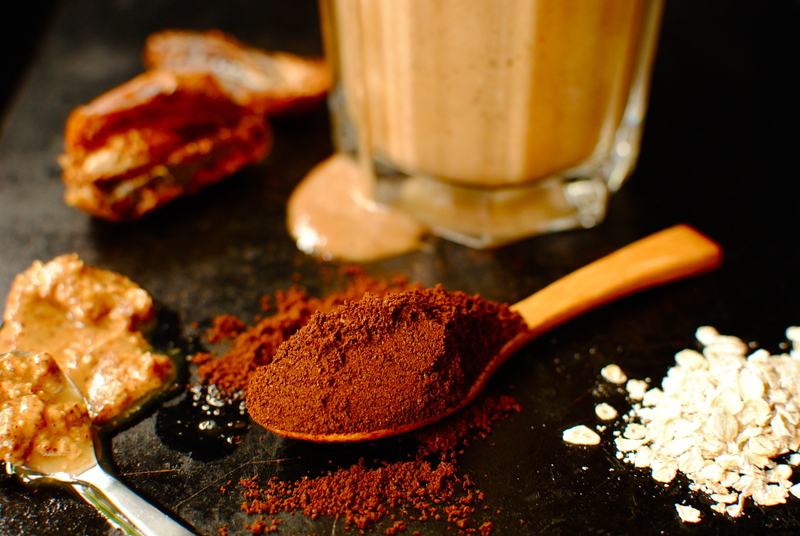 Or even leave out the coffee altogether and use all milk (dairy or non-dairy, as you like) with perhaps a dash of coffee extract (Nielsen-Massey will sort you out). See the other options below – mocha anyone? So, if your usual porridge and hot coffee (or danish and coffee?) 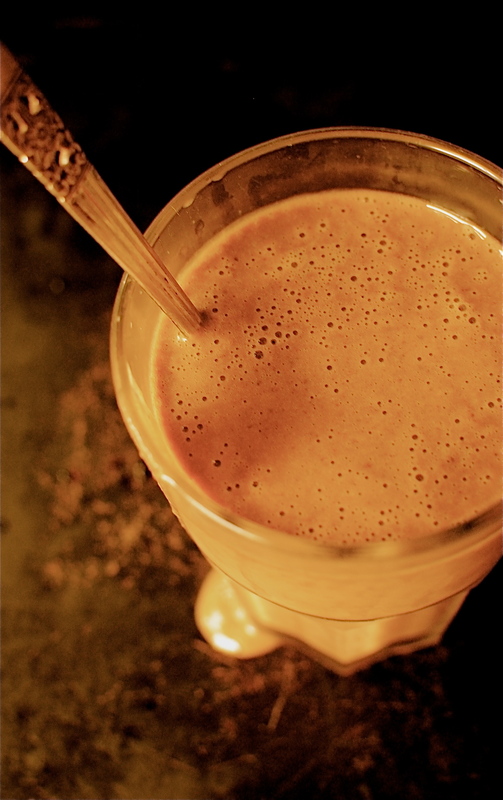 have you all hot and bothered, whiz your way to a summer wakeup shake. I won’t tell, if you won’t. PS If you want to know what I got up to last weekend, see this post by the wonderful and talented Sally at My Custard Pie. Warning: this post might make you hungry! Cool, creamy, breakfasty. This simple recipe is easy peasy to customise: add dairy milk, almond milk or even a dash of dulce de leche for extra creaminess; leave out the coffee altogether and go for all milk; chuck in some cacao nibs or chocolate chips for a mocha vibe; use whole almonds instead of the almond butter; maybe go the spice route with a dash of nutmeg or cinnamon. However you want it be sure and keep a stash of sliced frozen bananas and creamy-smooth breakfast shakes can be yours in seconds. Beats a bowl of boring old cereal any day. Serves 2. Now, what are you waiting for? Get those bananas in the freezer! 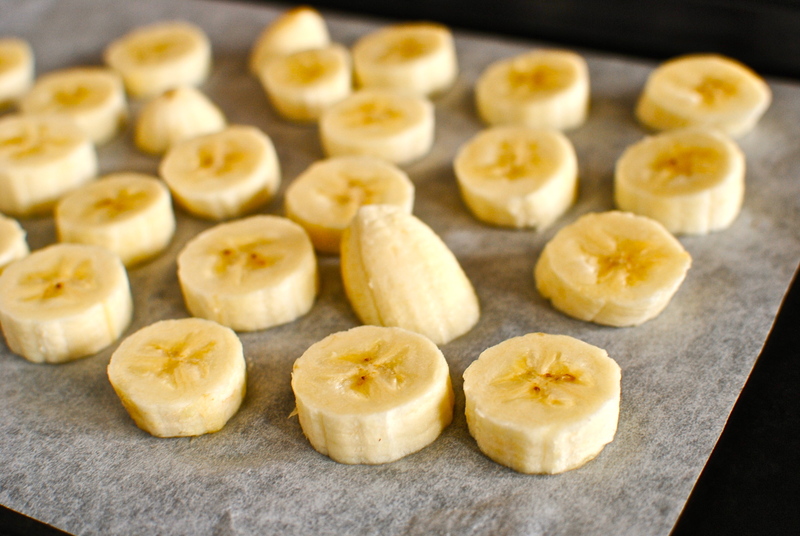 Lay the banana slices on a parchment-paper lined tray and whack in the freezer for 1 hour, or overnight. When you are ready for your amazing breakfast, pop everything in to a blender or use a stick/immersion blender and blend until ultra-smooth and creamy. You can also pop this into a freezable container and use as an ice cream too. If you do this, perhaps top with flaked, toasted almonds. Nutrition Notes: Oats and bananas are the star turns here, but even coffee gets some plus points. As for the oats, well what can I say that you don’t already know? Loads of fibre (obvs), including cholesterol-lowering and gut-cleansing beta-glucan, but also quite a bit of plant protein in the form of avenalin. Add to this some manganese, selenium, phosphorus, iron and magnesium and you have a great way to start the day. 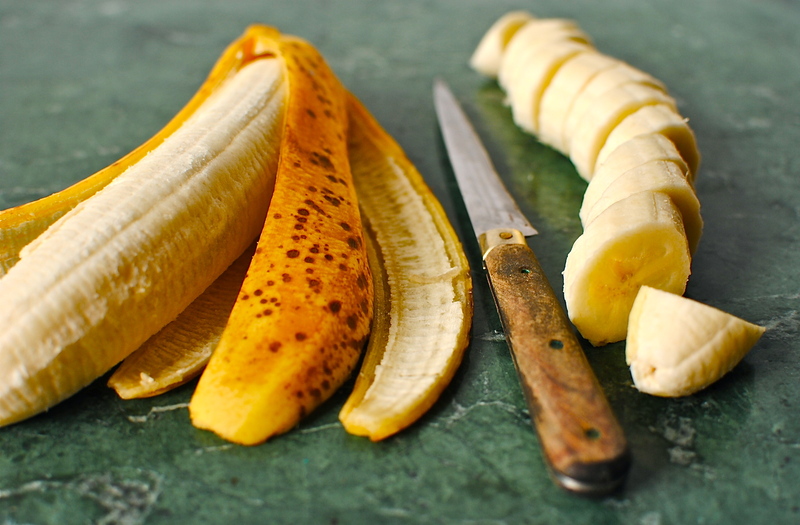 Bananas are also a decent source of fibre, and have good amounts of Vitamin B 6, lutein and Vitamin A (betacarotene). This popular fruit is perhaps most ‘famous’ for being a very rich source of the workout-recovery nutrient, potassium. The raw egg and oat thing is very American, circa 1970s. I wouldn’t be keen on a raw egg myself! The almond butter and almond milk for protein will do just fine for me. Frozen bananas are very useful to add to any smoothie or as an ice ‘cream’ as they get so incredibly soft and fluffy. And stay that way. Looks good at any time! Thanks. You are, of course, so right. My husband had some leftover shake after work. And because of the properties of whizzed up banana, it was still the thick and fluffy. No yucky emulsifiers! I love this milkshake as much as I love that Arctic Monkey’s song so double bonus points to you! 😉 Glad you had a ball at the food blogging conference and that you met up with lots of great bloggers. I think that has you neck and neck with your daughter if I am not mistaken…best not gloat too soon, you have some musical hunting to do before your next post ;). This sounds like the perfect start to the day. For me it has to be coffee and including frozen bananas and almond butter sounds like a milkshake for grown ups to me. I have also bought some Ndali vanilla powder and am in love with it. Hw my tastes are changing and for the better. This is a wonderful breakfast idea! I have Steenbergs vanilla powder and I find it useful in things like this where heat won’t be neutralizing the preserving alcohol. But in this shake the smidge of alcohol is completely overwhelmed by the coffee! I hope you make this. It is of course nice without the coffee, or with only a couple of tbsps, and serving to children. Lovely to have had a wee chat with you at FBC. Enjoy your summer. Stay cool! Love the addition of the fat, stoned date, lol!! Sounds delicious so must try this one! I was wondering if anyone would catch that! This looks like a perfect start to the morning! Hi Kellie, this sounds great! What would you suggest to replace the oats? I was advised yesterday to look at a low fodmap diet. Thank you lovely for your advice. 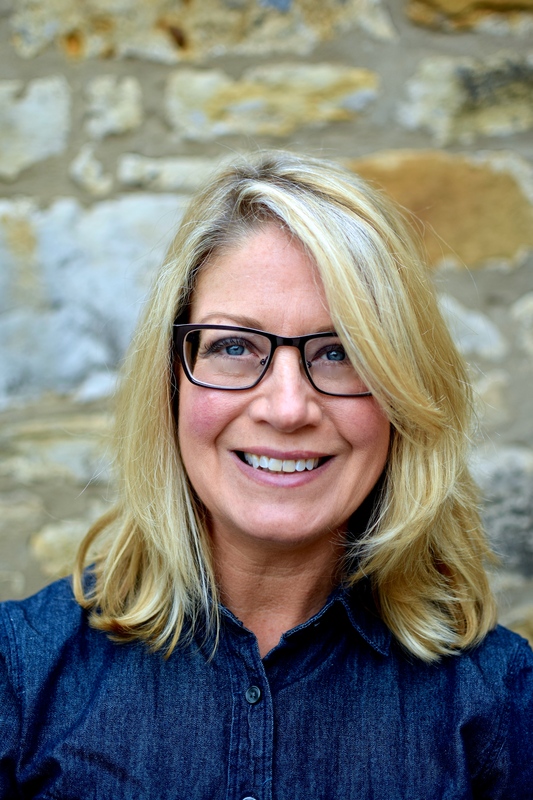 FODMAPs is a great idea. I suspect that occasionally I could do with following it myself, but I am both a coward and not consistently bothered enough by symptoms. Giving up onions would be hard! I hope it helps. As for the oats, at least here in the UK we can get gf oats (Nairns), but buckwheat flakes would be good, and you would end up using them in loads of things following FODMAPs. I’m not an expert on this diet, so double check that buckwheat is okay. It is certainly gf though. Quinoa and amaranth would not be right re taste here. Perhaps teff? Or just leave out the grains altogether! seems my comment got swallowed (was trying to comment on iphone yesterday). Hi Kellie, sounds fab, will be giving it a go! Yay! Are you here or in Marrakech? I can imagine a frozen drink would be good in Morocco, but right now we are of course having our own extended heatwave. I think we (UK) were hotter than Rome and Miami yesterday! You can probably see that it is versatile so being a non-coffee drinker is not an obstacle to a frozen banana shake for breakfast! How about chocolate soy milk instead? Now then, now then. I love the look and idea of this shake but I know myself with a banana and milk combo. Not good. I think I will try this with the nearly going completely black banana I have on the counter before Tony throws it away! Perhaps with the coffee combo it will work. If not then perhaps I’ll just leave the banana out. This looks amazing! I was suitably impressed with my own healthy banana milkshake for brekky yesterday. I think this recipe is on the cards for next time, minus the coffee! Hi Kellie, This looks fabulous! I love frozen bananas. I don’t have almond butter, but maybe I could substitute peanut butter? This reminds me of the banana milkshakes my mom would make for us as kids, but it’s healthy AND has my favorite ingredient, coffee! Thank you for this amazing recipe. 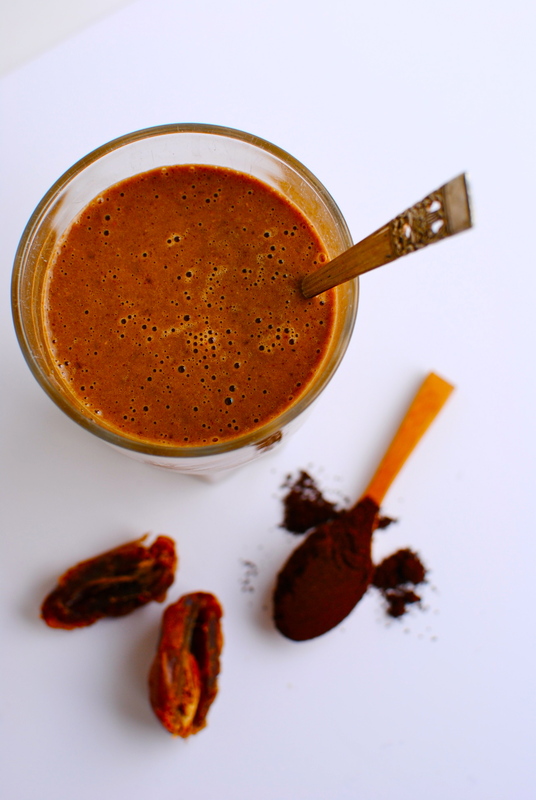 I wouldn’t dream of smoothing out the edges, with a decaf version of this dreamy shake. Fully caffeinated for me all the way! I’ve done oats in my apple pie smoothie, and I must agree-they work fabulously in a smoothie/shake. Well done! I definitely need to make this for breakfast soon! I wish I had seen this before I put my spare bananas into a smoothie. Looks lovely and refreshing Kellie – just the thing for the heatwave we are experiencing in the UK at the moment. A great afternoon pick-me-up, I’d say. Fantastic combo, as frankly, I am getting a little weary of all the kale lately. Variety is so important in our diets. Healthy eating CAN BE FUN! Thanks for the reminder. Oh my! I just bought a Vitamix and am having a great time making all kinds of smoothies. 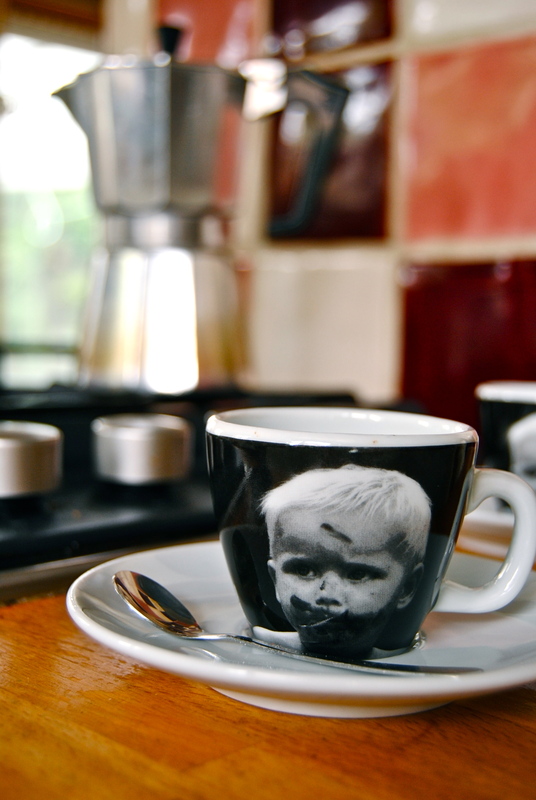 But this one–with the coffee right in it!!! Can’t wait for the morning to try it! I made your delectable shake & love it so much! It was amazing!